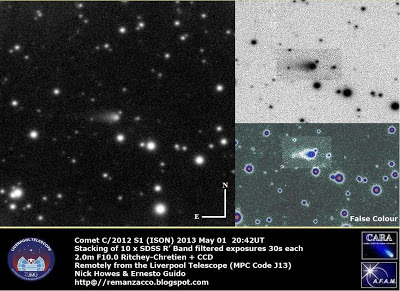 Comet C/2012 S1 (ISON) was discovered on September 21, 2012 by Vitali Nevski and Artyom Novichonok on CCD images obtained with a 0.4-m f/3 Santel reflector of the International Scientific Optical Network (ISON) near Kislovodsk, Russia. Comet C/2012 S1 (ISON) will get to within 0.012AU of the Sun (extremely close) at the end of November 2013 and then to ~0.4AU from Earth at the end of December 2013! 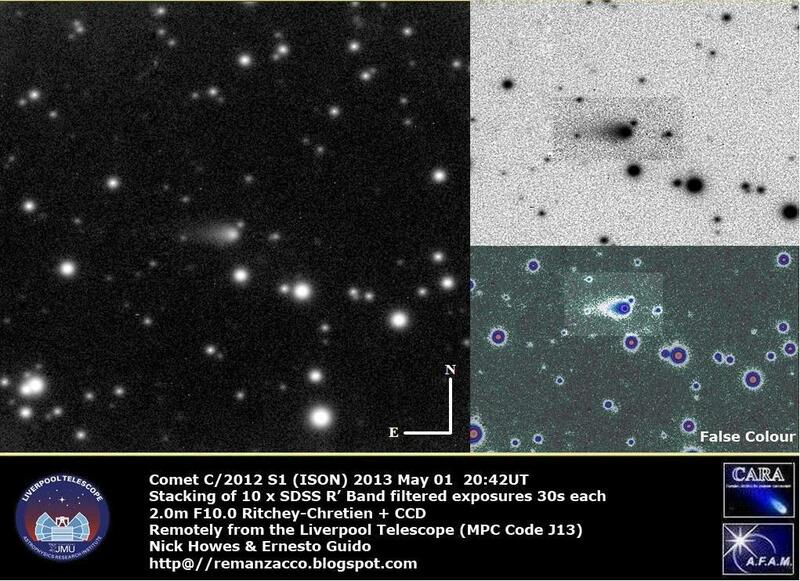 According to its orbit, this comet might become a naked-eye object in the period November 2013 - January 2014. And it might reach a negative magnitude at the end of November 2013. For more info about the discovery please see our previous post here. 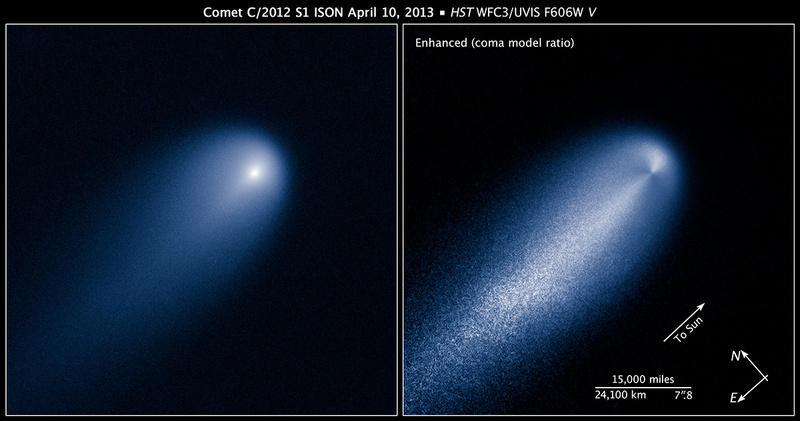 While here & here you can read our October 2012 updates about comet ISON. Our Team working with a suite of Hubble sized telescopes in Australia, Hawaii and the Canary Islands is collaborating with a range of professional scientists in an attempt to get high spatial resolution data on comet C/2012 S1 (ISON). 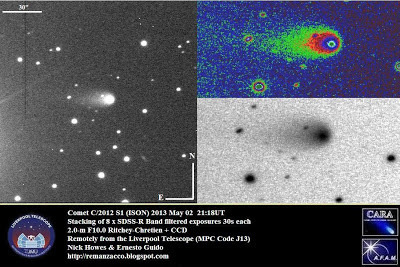 Supported by the Liverpool John Moores Astrophysics Research Institute and the Faulkes Telescope Project we have been imaging C/2012 S1 ISON since the day it was discovered, being part of the discovery MPEC for the comet ourselves. Our recent images taken with the 2m Telescopes on La Palma are being worked on as part of an ongoing collaboration which started with Comet 103P/Hartley 2 with Nalin Samarasinha, a Senior Scientist at the Planetary Science Institute (PSI) in Tucson, AZ, USA. Nalin, a specialist in comets at the Planetary Science Institute, has been looking at the detailed structure of the near nucleus coma of comet C/2012 S1 ISON using data we are delivering in to the PSI. (click on the images below to see a bigger version). 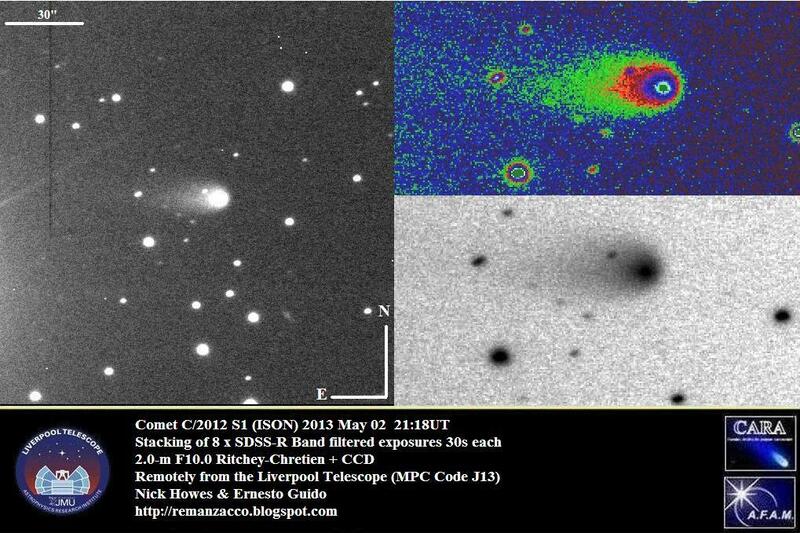 Most recently, Nalin had looked at image comparisons for our team’s dataset from May 02, 05, and 07 taken with the F10/2m telescope on La Palma, using an extremely sensitive camera, perfectly suited for detailed comet work. "This comparison shows that the sunward feature we suspected from images taken on 02/05/2013 is originating slightly north of west and then the position angle (PA) of the feature (measured from north through east) increases as one moves away from the optocenter" quotes Nalin. The exact PA of this feature is tricky to determine, as it will depend on how far away from the optocenter that you look at and when near the optocenter, PAs can be very uncertain. Nalin's interpretation is that the curvature of this feature is not due to any rotational effects but is due to radiation pressure pushing dust grains towards the tail. Ultimately, this feature merges in with the tail. This amazing result from a ground based set of observations, is in close agreement with features detected by the Hubble Space Telescope in images taken in April of this year. It goes to show how valuable ground based observations can be. As the comet comes closer to the Earth the spatial resolution will improve, and we should get more detailed views on the coma structure. Ongoing collaborations with scientists with the amateur community have been discussed in many recently published papers, and this is a prime example of one that is delivering valuable scientific data on a hugely interesting object. Asteroid (285263) 1998 QE2 was discovered on Aug. 19, 1998, by the Massachusetts Institute of Technology Lincoln Near Earth Asteroid Research (LINEAR) program. 1998 QE2 has an estimated size of 1.3 km - 2.9 km (based on the object's absolute magnitude H=16.6). It was observed by the Spitzer Space Telescope by Trilling et al. (2010), who estimated that it has a diameter of 2.7 km and a dark optical albedo of 0.06. This asteroid will have a close approach with Earth at about 15.2 LD (Lunar Distances = ~384,000 kilometers) or 0.0392 AU (1 AU = ~150 million kilometers) at 2059 UT on 2013 May 31 and it will reach the peak magnitude ~10.8 on May 31 around 2300 UT. (285263) 1998 QE2 will be a great Goldstone radar target May 30 through June 9. This is going to be one of the best radar targets of the year. Radar images from the Goldstone antenna could achieve resolutions as fine as 3.75 meters. We performed some follow-up measurements of this object, from the Q62 iTelescope network (Siding Spring) on 2013, May 17.36, through a 0.50-m f/6.8 astrograph + CCD + f/4.5 focal reducer. Below you can see our image, stack of 15x10-second exposure, taken with the asteroid at magnitude ~14.5 and moving at ~3.13 "/min. At the moment of the close approach 1998 QE2 will move at ~23 "/min. Click on the image below to see a bigger version. North is up, East is to the left. Radar images of asteroid 1998 QE2 obtained on the evening of May 29, 2013, by NASA scientists (led by scientist Marina Brozovic) using the 70-meter Deep Space Network antenna at Goldstone, Calif., show that it is a binary system. According to the JPL press release: "Radar images suggest that the main body, or primary, is approximately 2.7 kilometers in diameter and has a rotation period of less than four hours. Also revealed in the radar imagery of 1998 QE2 are several dark surface features that suggest large concavities. The preliminary estimate for the size of the asteroid's satellite, or moon, is approximately 2,000 feet (600 meters) wide. The radar collage covers a little bit more than two hours. In the near-Earth population, about 16 percent of asteroids that are about 200 meters or larger are binary or triple systems." We performed some follow-up measurements of this object on 2013, May 31.3 (few hours before its close approach), remotely from the iTelescope Observatory (H06 Mpc code), through a 0.25-m f/3.4 reflector + CCD. Below you can see our image, 1 single exposure of 180 seconds, taken with the asteroid at magnitude ~11.0 and moving at ~ 21.72 "/min. 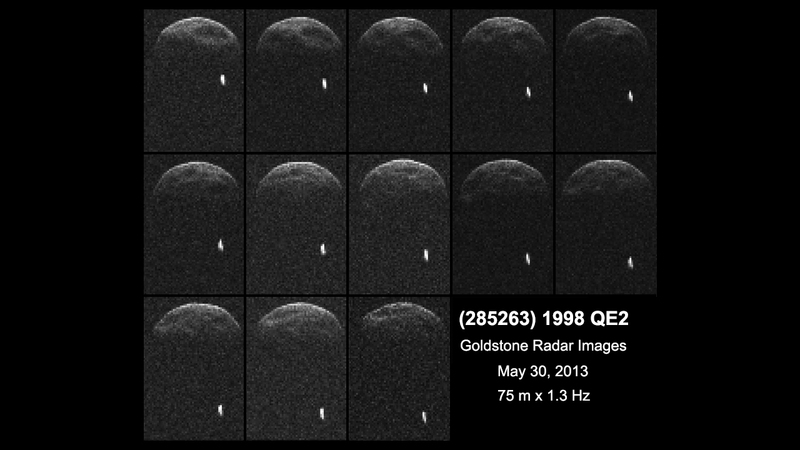 The asteroid is trailed in the image due to its fast speed. Click on the image below to see a bigger version. North is up, East is to the left.